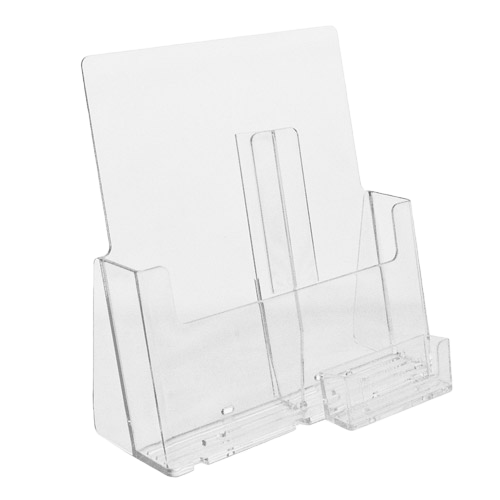 The Countertop Model Double Pocket Tri-fold Brochure Holder w/ Business Card Holder becomes a custom display utilizing add-on parts. This is a cost effective manner of displaying two tri-fold brochures side by side with the added feature of a business card, gift card, or coupon card. Suited for brochures up to 4 1/2'' wide with business card or gift card pockets. 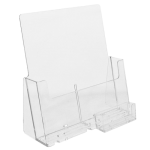 The Six Pocket Three Tier Tri-fold Brochure Holder w/ Business Card Holder will display two different or similar tri-fold brochures or printed cards up to 4 1/2'' wide. Frequently, customers will choose a business card or gift card. 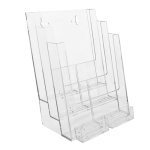 The side by side display will highlight your brochures and double the exposure in one convenient holder.